Students often have difficulty handling their feelings and need strategies to help them cope with the situation. These activities are designed to give your students strategies to use. It will help them to become effective problem solvers and to have better behaviors in your classroom. •Includes twelve characters with a story describing each feeling. •Each story describes facial cues and gives examples. •Includes 12 comprehension questions about the feelings described in the story. •Student has to cut and match the correct pictures. •Includes 12 comprehension questions about the feelings in the story without pictures. Student must circle the correct answer. •Students can write how they feel about all twelve feelings described in the story. •Students write their examples of what makes them feel a certain way. •Index Cards perfect for: inferencing, sequencing, comprehension, and much more! •After reading each scenario the students must: define each feeling, analyze the situation, identify the problem, and determine a solution. •There's more than one correct answer so encourage an open discussion with your students! Encourage discussions with your students to enhance their problem solving skills. • Stories describe facial cues, body language, and gives examples. • Includes 12 comprehension questions about the feelings described in the story. • Student has to cut, match, and glue the correct pictures. • Includes 12 comprehension questions about the feelings in the story without pictures. Student must circle the correct answer. • Students write how they feel about being: strong, satisfied, alert, and tired. • Students write their examples of what makes them feel that way. Each activity and picture is featured in color and black/white. • Includes 15 comprehension questions about the feelings described in the story. • Includes 15 comprehension questions about the feelings in the story without pictures. Student must circle the correct answer. • Students write their own examples of what makes them feel that way. The use of real photos will help increase your students' understanding of nonverbal cues. Print out on card stock and laminate for durable use. Also, print out doubles and play card games! 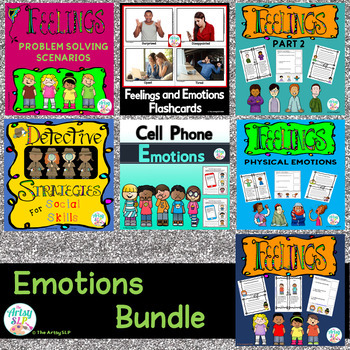 • Students read the definitions of the ten emotions. They will learn about each emotion by reading about nonverbal cues. Including facial expressions and body language. • Students read the text message that the child sent to someone else. Then they decide how that person feel, based on the text message. Your students will circle the correct answer from a choice of three. Then the students write how they know the person feels. Please take a minute of your time to leave feedback after purchasing this product and using it in your classroom. You earn one TPT credit for every dollar you spend that can be applied toward future TpT purchases. If you have a question regarding this product; please contact me at theartsyslp@gmail.com before rating so that I may better serve you.